If you’re looking for a fun and upbeat place to stay in the UK, then Brighton should be one of those options. Dubbed as the “happiest place to live in the UK”, Brighton does not fall short of attractions, sun, and adventure. One of the main attractions in Brighton is Brighton Beach. Brighton boasts of a long stretch of sand that is right beside Sussex coast. This shore is home to resorts, restaurants, and the famous Brighton Palace Pier. So where exactly is Brighton Beach? If you’re going to use the train, you can get to Brighton an hour from London, but if you’re going to take the plane, then it’s just half an hour away. If you check a map, you’ll see that Brighton is just to the south of London which makes it very accessible for day tours. Just beside Brighton is the town of Hove. This town is usually associated with Brighton because it’s literally just beside the beach. Both make up a unitary authority which is named Brighton and Hove. Together, they are considered as one city. The main feature of Brighton is no other than Brighton Beach. This long stretch of sand is where you will see the Palace Pier, a town amusement park filled with food stalls, shops, and arcades. What makes the Palace Pier unique from other amusement parks is that its design is mostly made up of decorative ironwork stretching out into the sea like the deck of a ship. 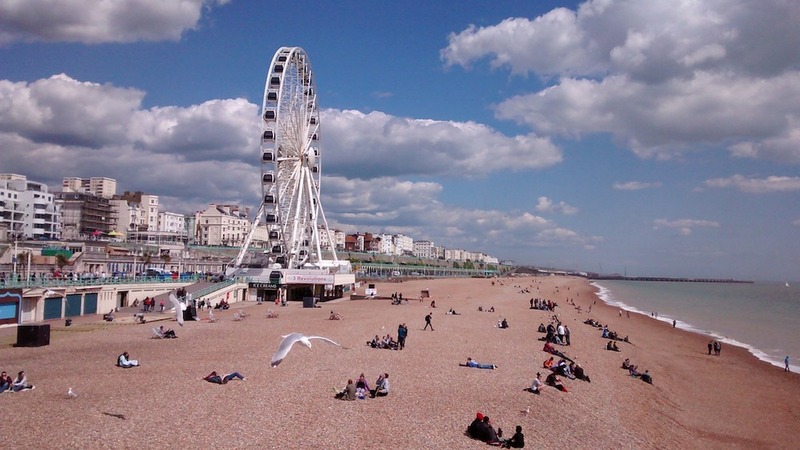 But as popular as Brighton Beach is, Brighton is equally blessed with tourist destinations on land. Just a few minutes from the shore is the Royal Pavilion which is the summer palace of the Prince of Wales. There’s also the British Airways i360 tower which is the tallest structure in the town. You can visit this 531-foot tower and take great pictures 453-feet above sea level. Brighton Beach is given the Blue Flag status which is an international endorsement that means the beach has high-quality public facilities and well taken care of beaches. Brighton Beach is filled with lifeguards and public rest rooms that help maintain the safety and cleanliness of the area. Aside from the facilities on the beach, Brighton has a double-promenade arrangement where the upper part is meant for cars and bikers. It overlooks the beach part where cots and food stalls are lined up. Aside from water activities, there are lots to do in Brighton with the place being one of the hippest cities in the world. For one thing, you can stroll around The Lanes which is a small village with boutiques and restaurants. If you wish to have a laid-back vacation away from the crowds, you can take the afternoon walking around The Lanes exploring galleries and drinking coffee. You can also join the Brighton Festival which is a three-week celebration during May. You’ll get to witness different shows and performances from art and dance groups. Mentioned earlier is the town of Hove. Hove is a nearby place where you can also enjoy food and drinks. Hove is a great place to try Sussex beer and mackerel. You can also pay a visit to The Attenborough and several smaller theatres in Hove.